We are beyond thrilled to share with you about The Seed Experience 2015 – we love promoting healthy, delicious foods that are great for you and the planet and so we are pleased to announce that we have secured 50% off for Women’s Mafia members and friends with code Proseed50. The Seed Experience 2015 is a two-day festival that focuses on living a healthy, compassionate, and eco-friendly lifestyle. This June the 2015 festival includes over 100 best-in-class exhibitors, including local merchants featuring, sampling, and selling plant-based foods and environmentally friendly products and services. With the number of Vegans in the U.S. more than doubling since 2009, and over 100 million people in the U.S. consciously choosing to eat more plant-based foods, even though they are not vegan or vegetarian, excitement over this year’s The Seed Experience is at an all time high. 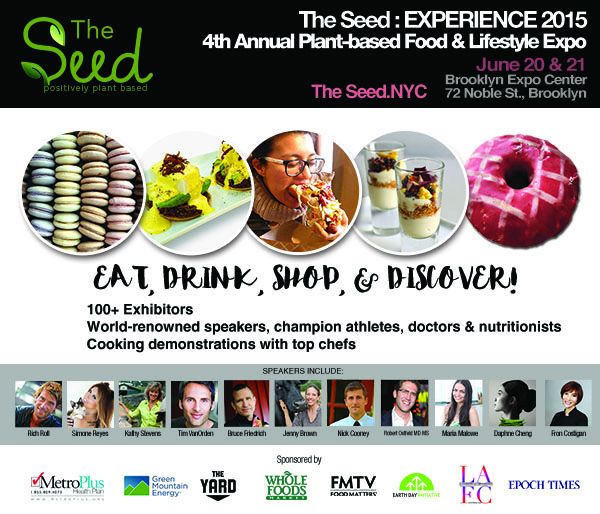 The Seed Experience 2015 will present world-renowned speakers including Joe Cross of the “Fat Sick and Nearly Dead” documentaries, doctors and nutritionists such as Dr. Robert Ostfeld, Founder and Director of Montefiore Einstein Cardiac Wellness Program, inspirational champion athletes such as Vegan Ultraman Rich Roll, and animal rights champions such as Kathy Stevens of Catskill Animal Sanctuary and Jenny Brown of the Woodstock Animal Sanctuary. They will be holding workshops to introduce audiences to a plant-based and vegan lifestyle and answer questions. Exclusive pre-premiere screening with “The China Study” author Dr. T. Colin Campbell’s documentary “PlantPure Nation” followed by a live video conference with his son Nelson Campbell, the Executive Producer, Director and Co-Writer of the film. Ten cooking demonstrations by renowned chefs such as Daphne Cheng, Maria Marlowe, Fran Costigain, and Jay Astafa. Opportunity to experience the cooking of Adam Sobel, owner of The Cinnamon Snail Food Truck, the country’s first organic vegan food truck, a celebrated, award winning all-vegan food truck. Four time Vendy Awards winner. Voted by Yelp! 2014 #1 place to eat in NYC, and #4 in the entire USA. Rich Roll, accomplished vegan ultra-endurance athlete and former entertainment attorney turned full-time wellness & plant-based nutrition advocate and motivational speaker. Top finisher at the Ultraman World Championships and best-selling author. Tim VanOrden, “U.S. Master Runner of the Year”, coach and presenter in the fields of motivation, nutrition and athletic performances. The Expo will be held the weekend of June 20 and 21st, 2015 from the hours of 10am – 6pm at the Brooklyn Expo Center in Brooklyn, New York. The expected amount of attendees is 5,000+. Ticket prices are $30 per day and $50 for the weekend pass. Included is an exclusive offer for a 30 day free membership to Food Matters TV (www.FMTV.com) value $7.95. FMTV provides hundreds of documentaries, expert interviews, and recipe videos. Attendees can also receive $25 off a first UBER ride, or $20 off a first uberPOOL ride. 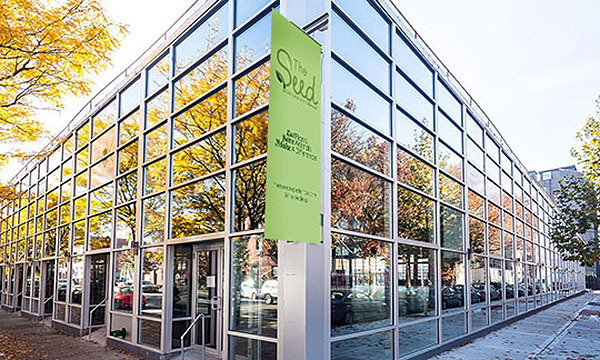 The Seed, founded in 2012, creates lifestyle events that empowers and introduces attendees to a plant-based, cruelty-free and eco-friendly living. Taking a positive and modern approach, The Seed works directly with many small local businesses and large multi-nationals, and influencer and trendsetters introducing them and their products and services to individuals who want to live an active, conscious and healthy lifestyle. The Seed is also a firm believer in giving back, therefore, a portion of the profits are donated to various charities. This year The Seed is projected that over 28,000 attendees at its events. 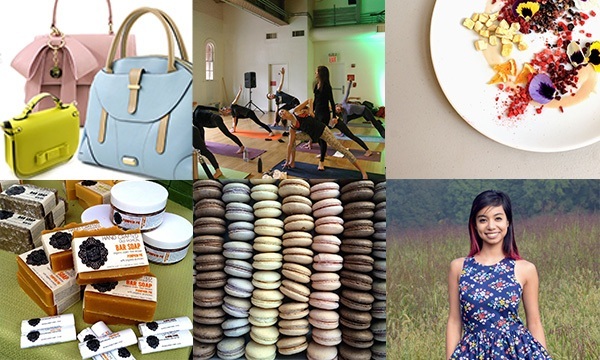 Follow The Seed on Twitter @TheSeedExp and Instagram and visit the main website www.theseed.nyc to read about all their events.